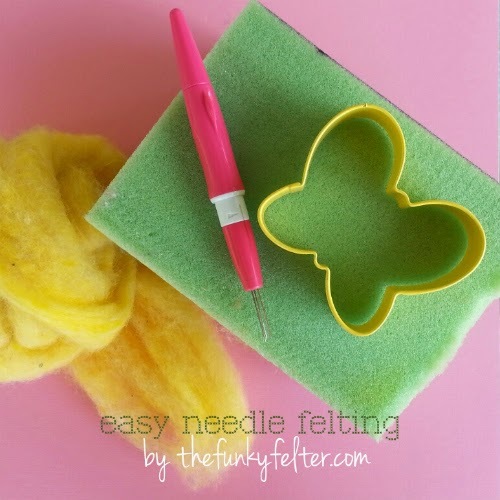 Use a cookie cutter to create the adorable needle felted butterfly! Maybe you've needle felted before or you are curious, well, this is really the perfect project for the beginner or novice. It is also a great craft for older children with adult supervision. I've used cookie cutters for many years to make small to medium sized needle felted shapes. The skies the limit as to what shape cookie cutters you can find. 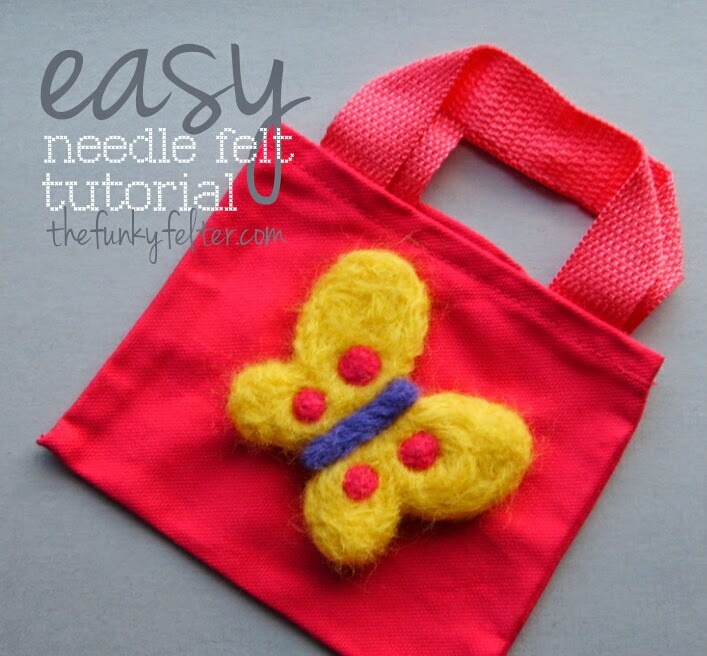 For this little kid's canvas tote bag, I used a 3 inch wide butterfly shaped one as my guide. It is as simple as filling the shape with a pile of crisscrossing wool roving and using a felting needle to work the fibers into a mass of pretty wool. The cutter helps keep the wool edges inside the shape while you felt - making it much easier to get good results. The craft tutorial below is pretty short and sweet as it is a very uncomplicated way to needle felt. When you're done, you can attach the felted wool shapes to all sorts of things like the miniature canvas tote bag above. It makes a fun little children's gift, especially when filled with goodies or toys. If you are brand new to needle felting, I recommend checking out my Feltmaking Tools and Supplies board on Pinterest to see what's out there along with some technique info from various sources. There's also some more information on traditional wool felt on my main website so have a look there too. And, you can always feel free to leave a comment or question or get in touch directly with me. Happy felting! 1. After gathering your basic supplies, find a well lighted area away from any distractions (don't want to poke yourself if you can help it - believe me, I know!). I also don't recommend doing this around small children as curious hands can get caught in the process so be careful not only how you needle felt but also where you do it. 2. Place the cookie cutter on your dense foam pad and fill it with 4-5 layers of crisscrossing wool roving. Tuck the wool all into the cutter shape. It will make quite a puffy mountain and that's okay. That's exactly what you want right now. 3. Using your felting needle, or better yet a multi-needle felting tool, poke straight up and down at the puffy wool. The first few minutes it will seem like it is futile and nothing is happening, but the more you repeatedly poke at the wool, the more the fibers become intertwined and the the felted shape will start to form. Be sure to keep your needle(s) going in and out at a straight angle each time or you will break them (been there and done that many, many a time). If that happens, wrap the needle up in a paper towel or secure it before discarding so no one gets hurt when taking out the trash, and of course, grab another needle to start felting again. 6. The finished needle felted wool shape can be attached to many different things. For this one, I stitched it onto a miniature canvas tote bag as a kid's gift. You could also decorate a backpack or t-shirt. If you aren't much to sew, then use hot glue to attach it. I'll be showing some examples of more cookie cutter felted shapes in future posts. Be sure to subscribe so you don't miss out on the fun to come!